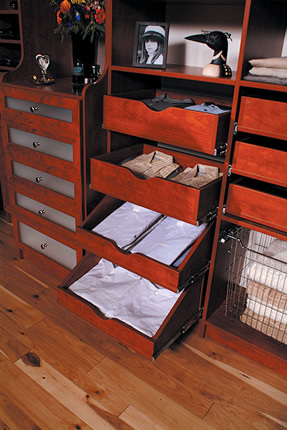 One would think that obtaining a custom closet organizing system would be no big deal...a walk in the park...a no brainer. But au contraire. Just like anything else that you may buy, there are lots of variables and choices that go into the construction of custom closet systems and you should be educated as to what makes for quality in custom closet systems. Whether you buy your closet organizing system from a local design and installation company, buy parts from a local big box retailer and install them yourself or purchase pre-designed, pre cut custom closet systems from an on line source you should know what you are getting for your money. Most companies use either ¾” or 5/8” thick material. The board can be finished in many ways. It can be plain MDF (medium density fiber board), unfinished particle board, melamine laminated particle board, painted board, veneer laminated board, HPL (high pressure laminated board)...the list is long. In my view however, the best choice is ¾” thick, industrial grade, thermo fused melamine laminated particle board. Some providers will tell you that 5/8” board is sufficient but it really isn’t the best choice. On longer spans the deflection (the amount he shelf will flex under load) is unacceptable and for vertical support panels it really isn’t as good as ¾” board either as it is more prone to bowing or flexing. A melamine surface is best because it provides the best combination of features when you consider surface smoothness, appearance, color or pattern choice, and, of course, cost. Melamine comes in a wide array of colors and wood grains with plenty of matching fronts and moldings available so you can achieve the “look” that want with out the need for lots of custom work that adds to the expense of the project needlessly. One of the single most important factors in the durability of your closet system is the edgebanding. Edgebanding is the material that is applied to the visible exposed surfaces of the board. It is there for appearance (raw board is unattractive), safety (raw edges are very sharp and can cause deep, painful cuts...kind of like a paper cut on steroids) and to give the job a “finished” look. In addition, if a melamine board is not banded on the edge, the melamine easily can be chipped and will immediately look unsightly. Many closet companies use an edgebanding that is only .018” thick (18 one thousandths of an inch). It covers the edge and looks ok in the beginning, but it is not durable at all and if it is hit, banged, dropped or in any way damaged the part affected will be chipped and look bad for ever as there is no really good way to repair a chipped or damaged edge. At the Closet Works, Inc. we have been using a thick, 2mm edgebanding on all of our banded edges for over 20 years and it is guaranteed to never chip or peel. I recommend it very strongly because the last thing you want is to install a beautiful custom closet storage system (or Murphy Bed or piece of furniture) and have it looking worn and ragged in short order. Some companies go to the extreme of using 3mm banding. I don’t recommend this because it really is no more robust under normal circumstances that 2mm banding and it is much more expensive. I would urge you though to make sure you are getting 2mm thick edgebanding and you will not have to deal with unsightly chips. Assembly hardware is another area where you want to be comfortable that the provider of your system has not scrimped. Closet systems should not be screwed (or, heaven forbid nailed) together. There should be connected at the joints with 32mm hardware specifically designed for the joinery of panel products. The fittings should be designed to assure tight, even joints and they should be made of materials that won’t corrode with time. This may not seem like a major point, but closets that are assembled with poor quality hardware may not last as long or function as well as those utilizing high quality joinery systems. The cost difference is small, but some purveyors look to cut corners wherever possible and all I can say is caveat emptor! Finally, a word about drawer slides. If your system is equipped with drawers or rollouts make sure that you are getting full extension, ball bearing drawer slides. Again, these slides come in varying degrees of quality, but even the lesser grades are a huge step up from the epoxy “Euro” slides that many companies provide as standard. These inferior slides are prone to failing, and they only open ¾ of the way making it difficult to get into the back of your drawers. There are lots of other areas we can touch on such as design considerations, green closet components, the debate about floor standing vs. wall hung systems, but alas, these are topics for future blogs. Stay tuned, and as always, please don’t hesitate to contact us with any question you may have.